Welcome to the second edition of our bi-annual commercial property publication, Commercial Journal. In this edition we have focused on some of the most important matters relating to both our society and industry. These include planning against terrorism, the rise of PropTech and the increase in serviced offices. 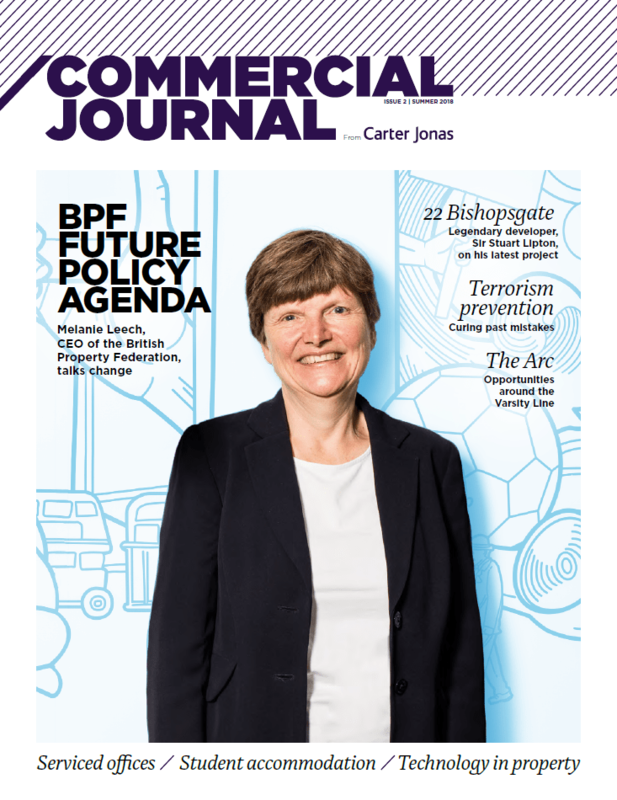 We speak to Melanie Leech of the British Property Federation about housing, high streets, procurement and Brexit. Also, we discuss the concept behind 22 Bishopsgate with legendary developer, Sir Stuart Lipton. Once again, we introduce you to a handful of our people at Carter Jonas. We’re sure you’ll be surprised at some of their hidden talents. We value your opinion, tweet us at @carterjonas and let us know your thoughts. We produce a wide range of commercial documents. Including research reports, publications and brochures on the specific services we provide.